Application for September 2018 and January 2019 courses is closed. Both have reached the maximum amount of participants. 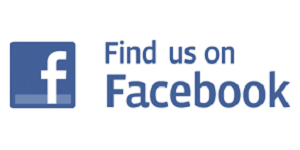 For questions, please email info@ehri-project.eu. Image below: Letter by: Nyura (Anna) Rabinovich, Trunovka-Kugulta, Stavropol Krai, USSR. Original language: Russian. Yad Vashem Archives: O.75/2670. 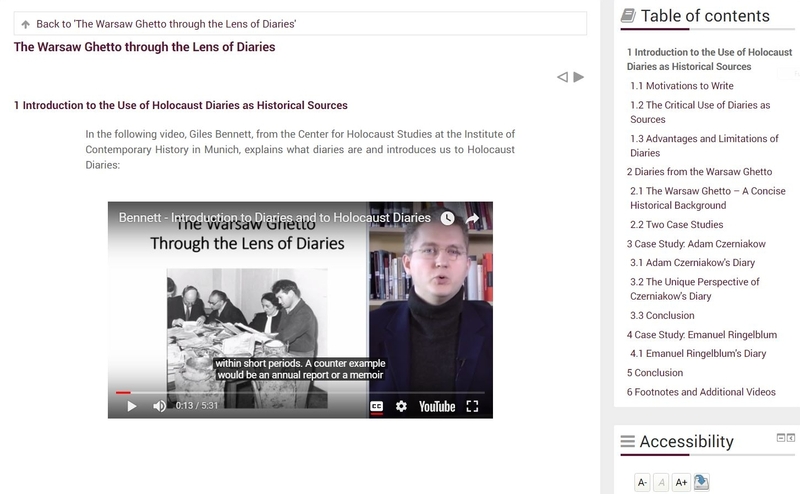 The EHRI (European Holocaust Research Infrastructure) Project periodically offers places in an interactive Online Course on “The Holocaust through the Perspective of Primary Sources” designed by EHRI-Partner Yad Vashem. With original documents and interviews with leading historians, it offers a comprehensive insight into various primary sources essential for Holocaust research. Discussions among the participants is supervised and supported, with written assignments guaranteeing a high scientific standard. The Online Course is aimed at the graduate level (i.e. 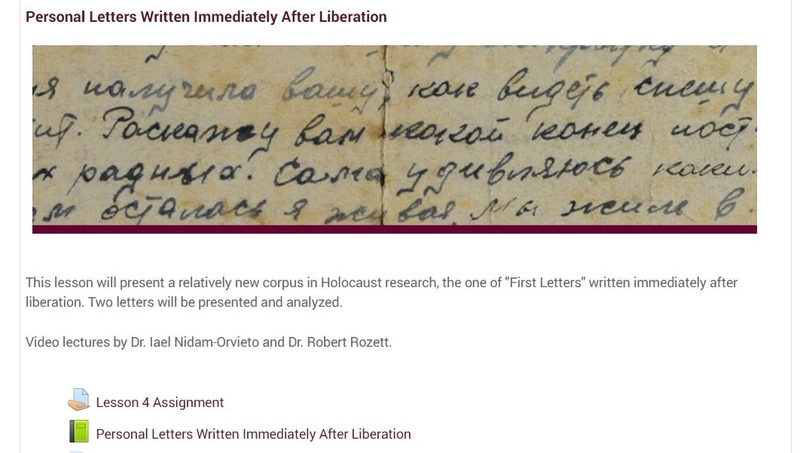 those holding a BA-degree or higher qualification) and offers a unique opportunity for scholars from a variety of disciplines (historians, sociologists, psychologists, anthropologists and others interested in the Holocaust) as well as archivists working in fields connected with historical archival research. The places in the Seminar are awarded on a competitive basis. After the introduction, a new unit is released to the participants every two weeks. The participants then have time to work through the unit's texts, documents, testimonies and expert interviews. At the end of every unit, questions (ranging in numbers from one up to four) are posed which are to be answered in paragraphs of varying extent. The questions are based on the information conveyed in the respective section and ensure that the participants can comprehend and are able to transfer the newly gained knowledge. The participants receive feedback on their work from scholars at Yad Vashem who already have considerate expertise in creating and conducting tools for e-learning. They can be reached throughout the duration of the course via private messages or in group chats. Next to evaluating the responses to the unit’s questions, they also provide assistance to any inquiries the participants might have about the content and procedure of the course. In addition, the participants are encouraged to introduce themselves to the rest of the group in chat forums, which are created to encourage and support the exchange between the participants as well as with the colleagues at Yad Vashem who guide the course and are the contact persons for every question the participants might have. The course is completed after the participants have turned in and received feedback on their final assignment presented in Unit 6. They receive a certificate for their academic portfolio, confirming their participation in the course. Participants of this online course use texts, documents, testimonies and expert interviews. Here are some examples of the course materials. 4 September 2017 (14 participants), January 2018 (12 participants), April 2018 (9 participants). Would you like to apply for this EHRI Interactive Online Course? The places in the Seminar will be awarded on a competitive basis. The deadline for applications to take part in this interactive EHRI Online Course is 10 April 2018. "The structured presentation of the importance of photographs and the methodological aid you presented us in this lesson really helped me in shaping my vision and in improving my analytical skills." "I learned way more than you can tell from my assignments and I appreciate the logical and comprehensive way this course was set up as. […] Thank you for teaching the most interesting online class I have ever taken." "[The EHRI online course] is definitely worth exploring, a wonderful experience. And given how so many of us on this list -- from grad students to experienced academics -- slowly tend to move into our specialize niches, it was a great opportunity to peek inside some of the niches in which others have been doing such fascinating work and see all that we may have obscured by our own specialization."